Carolyn (one of our fantastic Ambassadors) raced her first half marathon on September 20 at the Fox Cities Marathon. We caught up with her post-race to find out how the day went for her. Congrats Carolyn on your first 13.1! 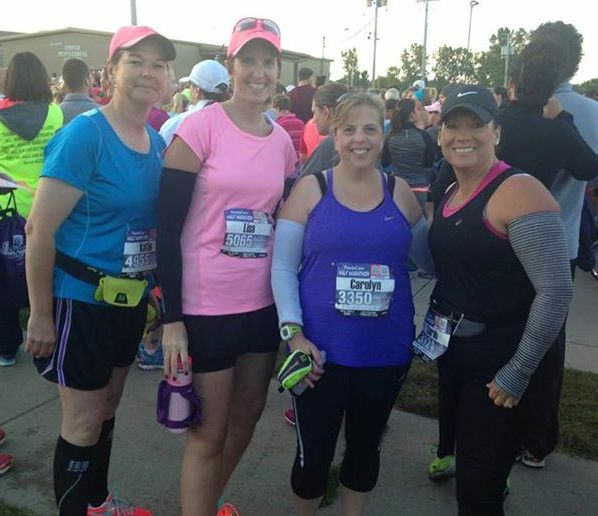 Carolyn (second from right) was joined on the course by friends (left to right) Katie, Lisa and Sarah. Congrats on your half marathon finish! How did the race go for you overall? "Overall, the race was a terrific experience. I beat my goal time by 3 minutes, so that’s a success in my book! What was the most exciting part of the event? "While this was my first half marathon, it wasn’t my first race, so I kind of knew what to expect at the start line. It was so much more than I expected, though. Everyone was so excited to start the race – there was so much energy at the start line. We were all encouraging and supporting each other, taking pictures, laughing, smiling, hugging…. It was a great start that carried me through the first few miles. I’ll have to say, though, that there were three exciting parts – the first was seeing my mom, my husband, and my younger son at mile 10, cheering me on. The second was seeing my fifteen year old son at mile 11 – he was a volunteer, helping to direct the runners on the course. As I went by, he yelled, 'I’m so proud of you, mom! I love you!' It meant so much to me to get those words of encouragement from him. The third was when my eleven year old son ran the last 50 yards or so of the race with me. He wanted to join me at mile 10, but I wasn’t sure I would be able to keep up with him! It was great to cross the finish line with him next to me." "The most challenging part was around mile 11.5 when a large blister on my toe decided to pop. I was feeling some discomfort in my toes, but nothing that was going to keep me from finishing. When I felt that blister pop, though, the pain was pretty intense. I finally realized that it hurt just as much to walk as it did to run, so I kept running just so I could finish sooner and get off the course! In retrospect, though, the issues I faced were pretty minor." Looking back on the training, what was the biggest lesson you took away from the weeks of training? "The biggest lesson I took away was that I am capable of doing more than I thought I could do. I sometimes got discouraged because I didn’t feel like I was making progress, but the coaches and mentors kept telling me what I great job I was doing. I finally believed them. The adrenaline of race day, the crowds, the music – it all combined to help me beat my goal. I wasn’t really nervous because I knew that I was prepared, and I had great friends to run along with me throughout the race." What was your favorite aspect of the training program? "My favorite aspect of the training program was the sense of accomplishment that I got after finishing a workout. I remember the first night, when we were told to go on a two-mile 'warmup' run. We couldn’t believe it; a two mile run used to be our whole workout! By the end of the training, we had done 10, 11, and 12-mile training runs, which was something I never thought I could do. The support of everyone else in the program was amazing, too. Even though I was one of the slowest runners, I wasn’t treated any differently than anyone else in the program. It was a great feeling to be included in a group that contained so many talented runners." Now that the half marathon is over, any new goals set? "Now that my toe is all healed up, my next goal is the Houdini 10K in early November, and then the Turkey Trot on Thanksgiving Day. The most important goal, though, is just to get out for a run at least a few days a week and keep up the base that I worked so hard to develop. Then maybe I can be in the advanced half marathon training program next year….. time will tell!"